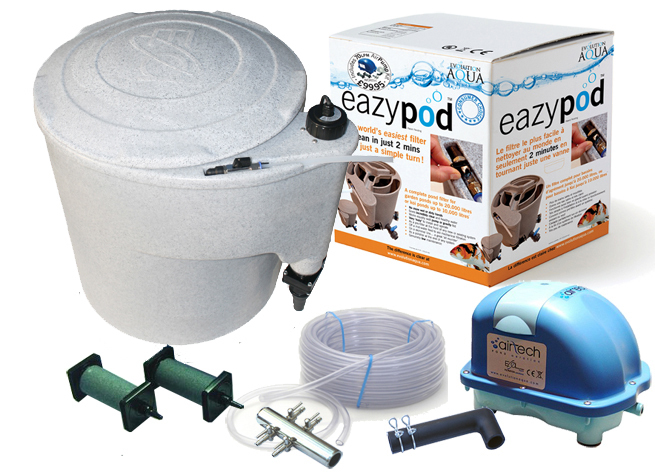 The Eazy Pod Air UV (complete with 18 watt Uv)Eazy, best small pond filter just got better ! Due to popular demand the Eazy Pod Air Uv Complete is now also available with an Airtech 70 Air Pump kit and built in 18 watt Uv. The Eazy Pod Air Uv complete for smaller ponds has unparalleled results, the Eazy Pod Air UV Complete is the latest to come from the Evolution Aqua stable and is set to meet the challenge of today's koi Pond enthusiast. The Eazy Pod Air UV Complete also comes with a compact lid as standard. The Eazy Pod Air Uv Complete is ideal on a quarantine system or as a pre-filter, polisher or on a skimmer line, a great all rounder! The Eazy Pod Air Uv is also perfect for extra biological filtration. Why not order your Eazy Pod Air UV, for the user who wants the ultimate performance. 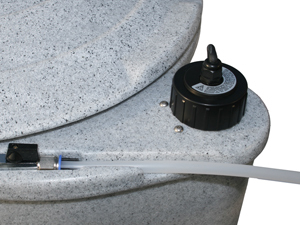 This will agitate the static K1 and therefore cleaning can be done quickly and easily without getting your hands wet, when you have done simply turn the air valve on the Eazy pod and send the Air back to the pond, it really is that Easy! There is little doubt that this New Eazy Pod Air Uv has turned the small filter market up side down, with the addition of the Air Pump kit, the Eazy Pod Air UV just got better! One more thing the Air pump kit is available to buy seperate at a price of £99.95, so this Eazy pod Air UV cost of £525.00 means the Air pump kit is 20 % cheaper buying as a kit, rather than buying separately.